Behold, the new Dislike button for Facebook users, an idea mooted on this very website last year. 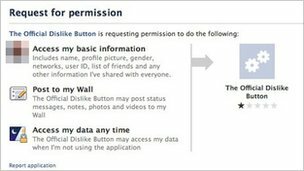 Only it’s not a button, it’s not from Facebook, and it can access your Facebook account. The BBC reports that the scam installs a rogue application, “which does not function as a dislike button” it reiterates, for those of you who are still not quite sure whether it’s kosher or not. On the surface, the user’s Facebook page updates with a link and a message. “I just got the dislike button, so now I can dislike all of your dumb posts lol!! !” as well as trying to get users to take part in a survey. The scammers get paid for this. Underneath, however, it’s a little less dumb, and worth changing your password over, even if you’ve been touched indirectly by it–i.e., one of your friends has and it’s shown up on your wall. Once inside your account, the scam launches vast quantities of spam lures to your contacts. From 200 to zero friends in an instant. Facebook already allows its users to Unlike stuff, but, taking an educated guess at it, a Dislike button would send anyone who uses Facebook for business purposes into a crazy panic. Overnight, firms could suspend their presence on the social network–something that is probably not in Mark Zuckerberg’s plans–or have to modify their behavior in order to avoid being “disliked.” 500 million users, after all, is a tasty slice of the market.